In a long line of dependable, long-lasting pickups, the 2019 Chevy Silverado was designed, enhanced, and crafted with the past 100 years of power, performance, and ingenuity that Chevy has worked toward. Designed to have a more functional, capable bed and lighter weight, the 2019 Chevy Silverado is prepared to be as durable and hard-working as you. The next-generation Silverado takes the traditional idea of “function” to new levels in its strong, bold performance. Sturdy and capable from the inside out, the 2019 Chevy Silverado is a strong statement with an even stronger look, with twin oval tailpipes, a large but firm frame, and a prominent side profile. The aerodynamic styling adds a heightened level of efficiency to the model, in addition to the lighter frame and fuel management technology. Even comfort and convenience take new heights in the 2019 Chevy Silverado design, with more leg room, storage, and enhanced climate controls, so no matter the job—you can handle it. The 2019 Chevy Silverado picks up where the model left off, as it was the first truck in its class to integrate technology such as Apple CarPlay and Android Auto into its design. The new-generation Silverado will have more features announced later this spring, but, for now, its marketing team teases with the classic aspects truck-owners have come to love. The new Silverado has a Wi-fi hotspot built into the cab, as well as wireless phone charging, so you can always be available and prepared for whatever life throws your way. The infotainment system has a touchscreen up to eight inches in dimensions, making readability and physical control easier than ever. Enhanced climate controls offer next-level comfort. The truck will include OnStar safety and security features, as with older models, with continued safety and convenience to be announced. The next-generation Chevy Silverado truck is the most-tested vehicle GM has ever produced, with stringent durability tests meant to survive the toughest of drives. With over seven million miles of testing before its debut, the 2019 Chevy Silverado delivers safety and security to drivers. The 2019 Chevy Silverado has three engine types available in the outgoing model, but can be fitted with six different transmission/engine combinations to provide the best fit for consumer needs in performance and efficiency. The newest and most notable option is the 3.0-liter six-cylinder Duramax turbo diesel, which is the first time the Silverado has been available with a diesel option since the late 1990s. The new 5.3L and 6.2L V-8s engines optimize fuel economy by shutting off any number of cylinders based on immediate needs, using the industry-first Dynamic Fuel Management system. The engines can also be paired with the Hydra-Matic 10-speed automatic transmission for continued improvement on fuel economy and efficiency. Initial fuel economy and efficiency are expected to increase by 21 percent over the previous model. A major change to the Silverado is the reduction of up to 450 pounds of weight. By using mixed materials and advanced manufacturing processes, the new-generation Silverado has been further optimized for durability, safety, and function. The redesigned suspension also uses a mixed materials approach, featuring aluminum upper control arms for wheel alignment accuracy. The upgraded suspension replaces steel rings with composite second-stage springs for increased performance and effortless handling. This redesign will improve steering and braking for a fluid and functional driving experience. Every truck’s bed is a defining characteristic, and the 2019 Chevy Silverado has improved on the bed construction and features to give the best performance to the best pick-up. The new Silverado comes with the best-in-class cargo volume, offering 63 cubic feet of volume in its short box by widening the bed nearly seven inches. The high-strength steel frame can handle 500 megapascals of pressure. The short box comes equipped with 12 fixed tie-downs that can easily handle 500 pounds of force, with nine moveable tie-points for the flexibility to get any job done. Bed storage accessories, designed specifically with workload efficiency and durability in mind, are also available. The 2019 Chevy Silverado also comes with a 120-volt power outlet and LED Rear Task Lighting located in the bed, so you can keep going wherever you are. A CornerStep bumper makes getting in and out of the short box easier than ever, with large footwells built in for work boots. The Silverado also has a power up/down tailgate that is class-exclusive and operable from the key fob, an interior button, or by hand. New storage options can also be found in the cab, where two 10-liter bins are integrated into the second-row seatbacks. The stretched cab also includes a 24-liter storage tray under the second-row seat, so you can keep what you need close at hand. You don’t ask for attention. You get it. 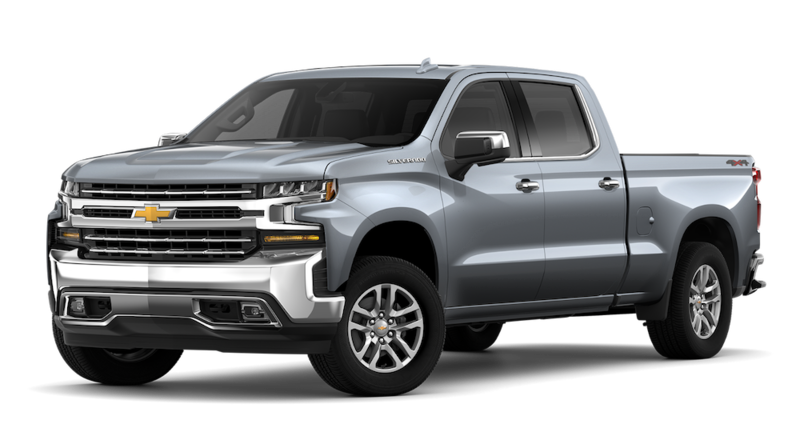 The 2019 Chevy Silverado takes a sleek, modern design and combines it with the classic Chevy truck look for a striking truck. With eight distinct model types, the truck is made with the truck customer in mind and avoids the assumption that one size fits all. Larger than ever, the truck is now 3.9 inches longer and has 44.5 inches of front legroom for extreme comfort, followed by 43.8 inches of rear legroom. In addition to the lush seating, the stretched cab creates an open, convenient cabin with increased square footage for storage and ease. The new aerodynamic shape allows for a smoother, more efficient ride while adding to its modern style, with functional air curtains featured on the front grille. In a throwback to the ‘50s and ‘60s design eras, the new Silverado has “CHEVROLET” stamped on the tailgate and includes an integrated spoiler at the rear edge. The new-generation Silverado trims are sorted into three categories: High Value, High Volume, and High Feature. Custom trim levels include a body-color styling, 20-inch aluminum painted wheels, and LED signature taillamps, while the High Features LTZ includes power folding, heated outside rearview mirrors, and leather interior trim. Buyers now have an unprecedented level of control regarding one of the most polarizing aspects: chrome. In total, there are eight trims to choose from. Customers can personalize their Silverado’s features and chrome for a one-of-a-kind look and a truck that is all theirs. We appreciate your interest in our inventory, and apologize we do not have model details displaying on the website at this time. Please fill the form out below and our team will quickly respond, or, please call us at (513) 741-1111 for more information. In the last 100 years, Chevy has built a reputation on creating durable, utilitarian trucks for the working man, so it’s not surprising that the 2019 Chevy Silverado features everything the dealership has built toward in its lifetime. Dealerships showcased the 2018 Silverado model with great skill, but only one stood out. The McCluskey Chevy proudly sells Chevy models and upholds the impressive reputation the company has built over the last century, providing applicable advice and knowledge, specialized car repair, and, above all, high-quality service to ensure all your needs are taken care of. We know you need a vehicle that works as hard as you do, which is why when it comes to customer feedback and demands, we make sure to take care of the details.